Just because you’re outside hiking in the rain doesn’t mean you have to be soaked to the bones. 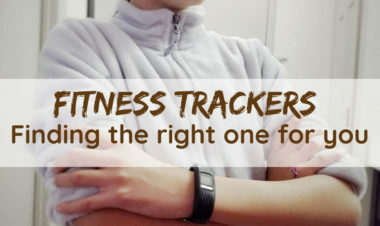 Make sure you are covering yourself and your kiddo from head to toe in waterproof gear. 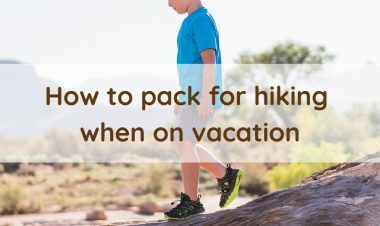 With careful planning and the right accessories to keep you warm and dry, you and your kiddo can enjoy your hikes and playing in the rain longer. When dressing your child, a full rain suit is a great option. There are no gaps in the material for water to sneak in. Oaki makes amazing rain suits and gear! My daughter has spent hours in the pouring rain and gone swimming in some epic puddles in hers. Afterward, I’m always shocked when I peel it off and she is completely dry underneath. If the suit is a challenge because of potty training or an older child who wants a little more independence, a long rain coat and pants works great. 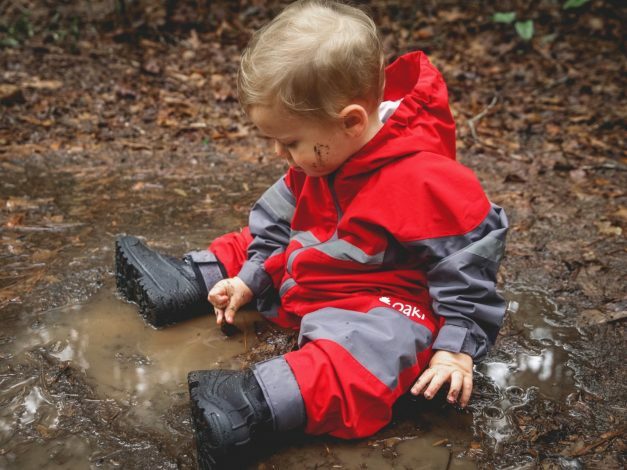 Pro tip: Size up in rainsuits if your little one will be in a carrier because it tends to pull the legs of the suit up and can leave gaps above their boots. Rain boots that are tall enough to be covered fully by the pants legs are a must. Make sure they are fully waterproof and insulated if you live where it is cold. Fortunately, most kids love rain boots, and they come in all sorts of happy patterns and colors. You will likely have more trouble getting your kids out of their rain boots than into them. Get yourself some waterproof boots too or minimally consider spraying your old hiking boots with waterproofing spray. If you’re carrying a pack with all your hiking essentials inside, get a pack cover to waterproof your cargo. And if you have a frame-style carrier like a Deuter, they make great rain pack covers to provide even more protection. If you are out in the rain with a stroller, look into one of the rain covers for the stroller that zip on and keep your kiddo warm and dry inside. Make sure to wear warm, wicking base layers to keep you cozy underneath. Wool clothing (like Luv Mother) is a great option – as it stays warm when wet and wicks away the moisture. Rain coats are often just shells so make sure to have solid layers underneath that you won’t sweat in but will hold in the heat. Bring a hat to slip on under a hood and a couple pairs of gloves since those will inevitably get soaked. Bonus tip: Hike it Baby offers discounts to members on many of these brands. Check out our Community Discounts page for current deals! 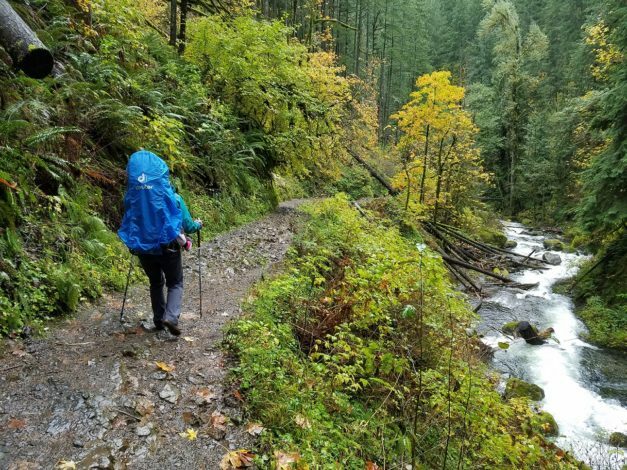 What are your go-to gear items or tips for hiking in the rain and cold? Leave a comment below! Gear gear, Hiking in the rain. permalink.